I wore this manicure to meet a lovely friend from Vancouver. Miss her already! I haven't done plaids for a while for a very stupid reason: I mess up my liner brushes and they are all split and unusable. Maybe it's time get them upgraded to sable brushes. Anyway, I free-handed this mani by using a tiny brush instead of a proper liner. That's why the lines are so 'waved'. I used E-Nail Wizard of Oz and Little Cherry for the base, and switch the colors for the lines. I also added the golden lines from my new color paint collection. Not too bad, right? The featuring bottle is E-Nail High Concentrated Topcoat. I have trouble with it, because it does change the colors. The lines are supposed to be white, but this topcoat turns it pink. Although this topcoat does make my manicure last a bit longer, I am not a huge fan then. I need to find another more brighter gold paint, this one is so subtle. A new excuse to shop around in 2014, lol. As you can see, I am behind the schedule again. 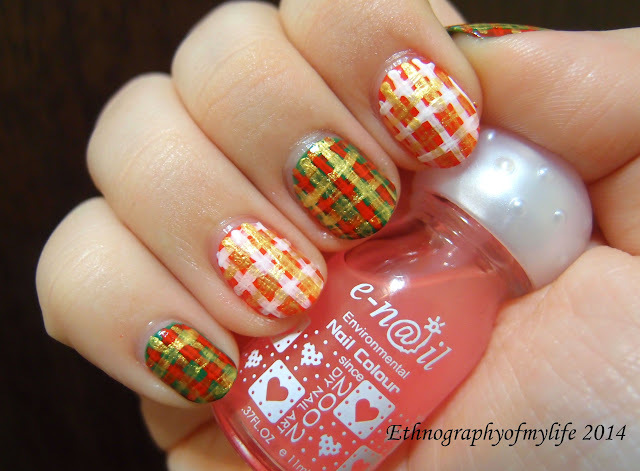 I have few more Christmas manis to blog about. 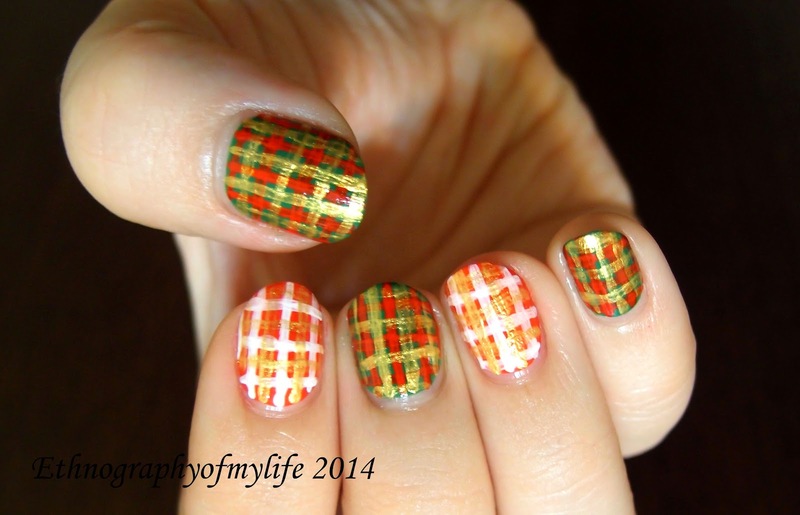 I usually don't post the current mani, because I like to store up 2-3 manicures and work on the photos together. Stay tune for more to come!